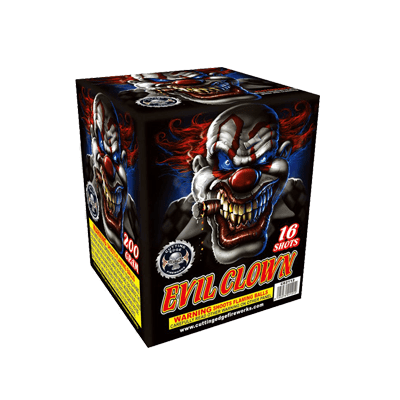 Evil Clown – 16 shots of green brocades to crackle. Crazy Exciting On Steroids - 16 Shots that go up 200 feet in the air with red, white, green & white crackling mines emiting showering sparks ascending up into red, green silver waves. Boiling Point - 16 Shots of colorful stars with silver glitter. Crazy Exciting - 25 Shots of red, green, white & crackling mine to red, green white and blue bouquet.